This newly built Great Gulf executive 3 bedroom, 2.1 bathroom freehold townhome end unit is located in Oakville’s desirable Preserve community and offers 2,150 sq ft of fully finished living space over 3 levels. The townhomes at Trafalgar Landing are Energy Star rated, helping to create a more energy efficient and environmentally sustainable community. The home includes the reassurance of a full Tarion warranty and many upgrades over the original builder finishes including 9' ceilings, 8' doors and oversized windows with triple glazing on all levels. Painted in neutral décor, the main level includes a large foyer with garage access, spacious family room with sliding glass door access to the backyard, 2-piece powder room with quartz vanity top with undermount sink and single lever faucet and utility room. The second level features an open kitchen, living room and dining room floor plan with laminate hardwood. The gourmet granite eat-in kitchen features a large island with breakfast bar, double sink with goose neck faucet, white easy clean soft close cabinets with deep pot storage and pantry, an additional full wall of cabinetry as an upgrade, matching Samsung stainless steel appliance package including; 5-burner glass top stove with oven, French door refrigerator with freezer drawer, built-in dishwasher, LG microwave and tile backsplash. The great room with access to a large deck completes the second level. The large 3rd floor master includes a 3-piece ensuite with separate shower wand, upgraded frameless glass shower enclosure and tile, upgraded heightened quartz vanity with undermount sink and single lever faucet. 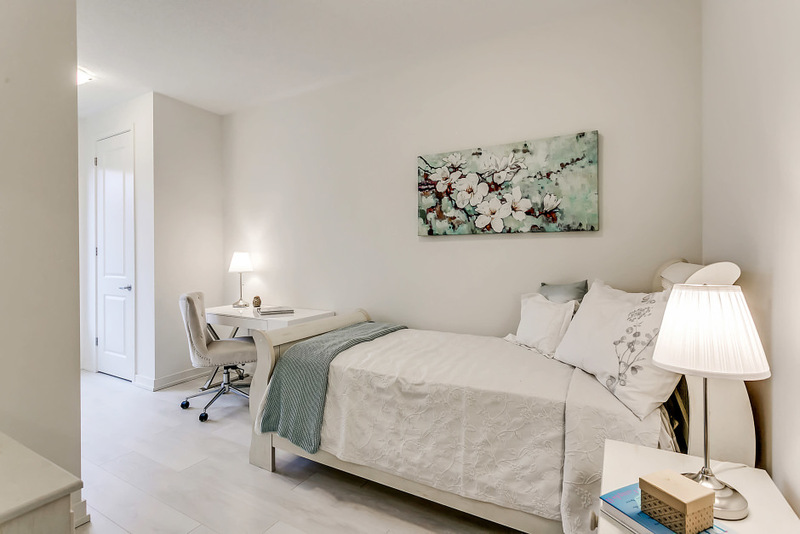 The remaining two bedrooms are generous in size and the main 4-piece bath with upgraded heightened Quartz vanity top with undermount sink, soaker tub, upgraded tiles and cabinetry and laundry room with matching front load stackable Samsung washer and dryer completes the third level. The concrete walkway and single car garage complete this wonderful home. Located a skip and a jump from Oodenawi Public School, St. Gregory the Great Catholic Elementary School and walking distance to stores, restaurants, parks, transit and minutes to the new Oakville Hospital, Go Station, highways 407, 403 & 401. Impeccably maintained, this home is a must see!